The rola-bola is also known as bongo board, teeter board or just spelled slightly different eg rolla bolla. It consists of a cylinder and a board (usually wooden) – you place the board on the cylinder, and then rock and roll side to side to try and stay balanced! It’s a bit like a one-man seesaw! Once you learn the rola-bola, you will need to combine it with some other tricks such as club juggling or plate spinning. Some safety issues before we begin! My tip would be to practice in the corner of a room with the board diagonally facing the wall, so that there isn’t too much space for the board to go flying in either direction. If anyone wanders into the rola-bola danger zone or tries to stand beside the rola-bola watching you practice, tell them to move or simply stop practicing. Non-Slip Only use solid boards with a non-slip surface. Extra Grip Rubber (eg a car inner tube) can be used around the cylinder to help improve grippiness. 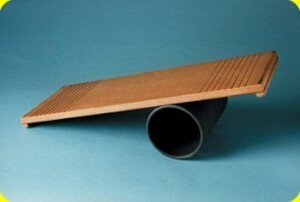 Skateboard grip tape can be used on the board. Wet Don’t perform with this prop if the board or cylinder is wet. It’s too slippy and dangerous! Strength of Board Make sure that board is of sufficient strength and material to be able to take the weight of you and any props you are using on it! Feet should be equal distance apart from the middle of the board. This makes sure your weight is as equally distributed across the whole board as possible. Your knees should remain bent at all times! Keeping your back straight, helps you to keep the centre of gravity over the cylinder. Eyes straight ahead helps to make sure you are not staring down at the board which can put you off balance. It may help to focus on a point at eye level in the distance. A standard balance is where you stand on the board with one foot at each end. The next step is to shift your weight so the board balances on top of the cylinder. You can use a support to help you get into position (such as a chair, wall, bannister etc). From here, you try to keep the board from moving, and especially stop the ends from touching the ground on either side! Please note that the aim isn’t to remain still on the board, but to gently rock from side to side. Try to increase the amount of time you stay balanced until it becomes really easy. They try rocking the board faster! HOW TO STOP: From a standard balance position, and keeping a light contact with your support, let the board move to one side. Placing all your weight on that foot (the farthest foot from the cylinder), the end of the board should touch the floor gently. Do this as slowly as possible as there is no point in crashing the board to the ground! Attempt this move until you able to do it without holding on to any support. If you find that the board crashes to the ground, then it means that you haven’t shifted your weight properly. HOW TO START: It does seem a bit silly teaching you how to start after I have taught you how to stop, but these tricks are worth learning in this order as you needed to learn how to balance first of all! From the stop position (one end of the board on the ground), slowly shift your weight back over to the other foot. This will edge the board slowly up the cylinder. You will soon begin to feel yourself tipping over the cylinder, at which point you need to shift your weight over the centre of the board once again! The Board is Drifting If you find that when you try to balance, you start drifting to one side and you end up falling off or coming to a stop with one end of the board on the ground, then bear in mind that you must take a load of your weight temporarily off the side of the board you are drifting towards. If you imagine a set of scales with equal measures on each side, and then you add some more weight to one side, then naturally the scales would tip towards that end. If the weights were then added to the other side also, then you would counter-balance and return to a standard balance movement! The Board is Twisting If you find that the board is twisting forwards and backwards instead of side-to-side then this is because your hips are rotating! Your hips should just be swinging from side to side, and not in every direction! Surfing This is where you balance on the rola bola so it looks like you are surfing (eg feet both pointed in the same direction, along the board, and in a slight crouch position). Best advice is to work through the standard balance tricks once again, but with your feet in the surfing position! Pause This is where you are rolling from side to side, and then suddenly stop with the cylinder at one end of the rola-bola. Obviously this is all to do with weight distribution! Slowly roll yourself towards one end of the board. Once the cylinder is near the end of the board, put all your weight on the foot that is over that side. Use the other foot simply to keep the board balanced, so that you do not roll back and forward. This is a useful pause trick for you to accept some applause from your audience! Crouch / Squat Slowly lower yourself into a crouching position, and then raise yourself back up to a standing position. While lowering yourself, it can be easy to completely lose your balance because your centre of gravity is also shifting, so take your time and be careful! Standing on one Foot Your foot must be on top of the cylinder. Best advice would be to try balancing on the cylinder without the board on top first of all. Walk on Cylinder Stand on the cylinder and try to move forward (similar to using a Walking Globe). Perhaps this could be your opening trick where the cylinder is at one side of the room, and the board is in the middle of the stage? What Props Could I use while I am on the Rola Bola? If you are already a juggler, then consider using whatever props you already use. Balls and clubs are relatively easy. Poi and Diabolo aren’t quite as straightforward! For my rola-bola routine, I use 2 Juggling Knives and a chicken! For any props you intend to use, be sure that you have practiced with them plenty of times without using the rola-bola. You won’t be able to move forwards and backwards to catch props, so your juggling must be smooth! Obviously certain tricks are not possible on the rola-bola (under the leg for example unless you keep both legs on the ground and do an albert throw!) Likewise, certain tricks which require very quick sharp movements (such as chops) may be best avoided as they could knock you off balance. Swinging poi is the equivalent of patting your head and rubbing your stomach as you try to swing props in one direction and roll yourself the other way, so it may be best avoided also! Another Person! It is possible for 2 people to stand on the board facing each other while holding hands or hugging (to help keep each other on the board, of course!) I have seen some performers also jump onto a rola-bola just as someone jumps off it. You would need to work on the timing and make sure that you exited forward and not to the side in case the trick didn €™t work as you would end up with a board flying towards you! 2 People could also face the same way (one person climbs up behind the other person). Jump/Turn Practice jumping while balanced on the rola-bola, then when this feels comfortable, try to do a 180 degree (half) turn, then finally build up to doing a 360 degree (full) turn. Keep your jump as low as possible as you do not want the board to start sliding to one side so you need to land as quickly as you can and with minimal impact! Jump Mount Ask someone to hold the rola-bola steady with the board horizontal and for them to let go just as you are about to land. Hands and Feet Hands on one side of the rola-bola and feet on the other side! Or just use one hand and one foot on either side. Do not place your fingers underneath the board just in case you come to a stop and squash them! Leapfrog! I have seen Luke Burrage leapfrog someone and land on a rola-bola! Only to be attempted if you are very brave or very foolish! My favourite rola-bola trick involves club rolling. I place 3 clubs in front of the rola-bola and by pushing them lightly (which involves lowering my body so I can touch the clubs on the ground, and reaching forward, so I am a bit off balance), I can make them revolve around the cylinder and back to their starting point. You have to make sure that your board stays far enough off the ground in order that the clubs can roll the whole way round! For further information on club rolling, please visit my Club Rolling Tricks Page. Picking up props from the ground: An entertaining trick which builds on the squat/crouch trick from earlier is to pick up your props from the ground, one at a time! When performing, make this trick look really difficult by wobbling the board and looking as if you are about to fall off, but it should be easy if you can lower yourself!